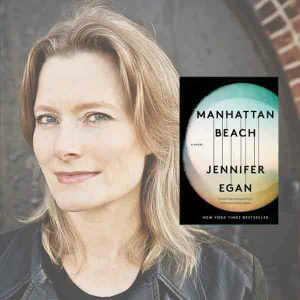 In Jennifer Egan’s latest novel Manhattan Beach, she explores the underexplored in a well-mined setting—WWII-era New York. Through multiple narrators, Egan focuses on richly imagined characters: a young woman who works in the Naval Yards and becomes a pioneer diver, an Italian gangster and nightclub owner, a bagman who leaves his family and becomes a merchant marine. We will approach this reading from the central technique of Egan’s storytelling: her masterful and nuanced rendering of human relationships—familial, romantic, adversarial, and unconditional.